"I had been punishing the wrong person…" Saban Films has debuted an official trailer for an action thriller titled Acts of Vengeance (originally titled Stoic), about a lawyer who goes for revenge after his wife and daughter are killed. Yes, we've heard that exact emotional plot description 100 times before, so here's yet another vengeance movie for those who want it. Starring Antonio Banderas as Frank Valera, with a cast including Cristina Serafini as his wife, plus Karl Urban, David Sakurai, Paz Vega, Robert Forster, Lillian Blankenship, and Clint Dyer. This film is obviously all about the action, and the act of getting vengeance (hence the title) though I doubt it has much more to offer. Check it out below if you're interested. A fast-talking lawyer (Antonio Banderas) transforms his body and takes a vow of silence, not to be broken until he finds out who killed his wife and daughter and has his revenge. Acts of Vengeance (formerly known as Stoic) is directed by Israeli B-movie filmmaker Isaac Florentine, of all kinds of cheesy films including Desert Kickboxer, High Voltage, Bridge of Dragons, Ninja, Assassin's Bullet, the Undisputed trilogy, Ninja: Shadow of a Tear, and Close Range previously. The screenplay is written by Matt Venne. The film has not premiered anywhere before this yet. 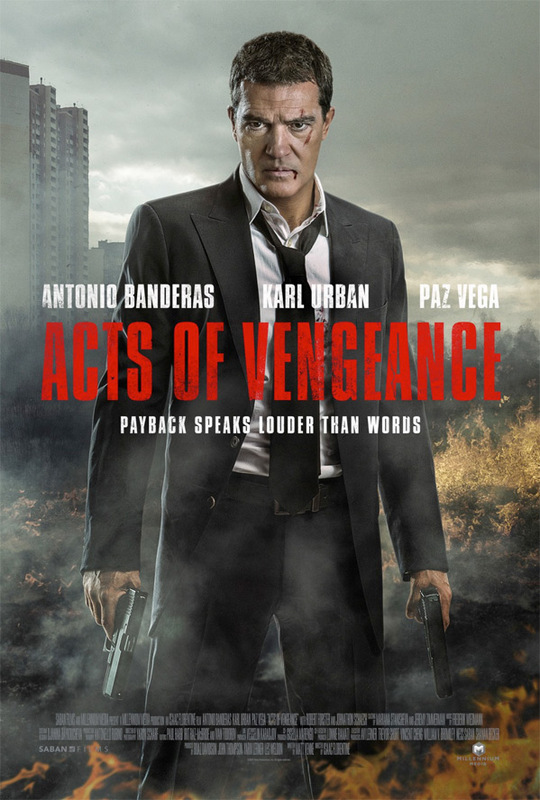 Saban Films will release Florentine's Acts of Vengeance in select theaters + on VOD starting October 27th late next month. So does anyone actually want to see this?